Built of red bricks in the New Moorish style, the Arc de Triomf rises majestically at the end of the Passeig Lluís Companys. In 1888, the triumphal arch served as the main entrance to the World's Fair. The arms of the city of Barcelona and of the 49 Spanish provinces were placed around the arch. 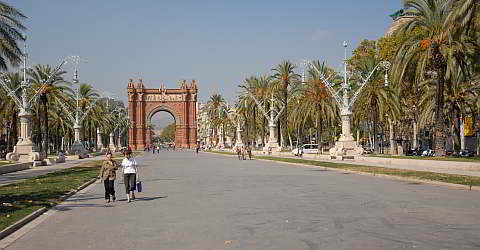 Several of our tours lead to or past Arc de Triomf. Parc de la Ciutadella tour: approx. 60 minutes. On the open Segway tours you drive with other guests at predetermined times. The starting times can be found on the right side of this page. Private Segway tours can be booked here. No open Segway tours on December 25 and January 1. Please note that the maximum rental period applies until the shop closes at the issuing office. So start the tour early to be able to use the booked time completely. To book, simply select the product on the right side of the page and enter the number of persons you would like to book for. You do NOT need a driver's license to drive the Segway. Several groups can be combined. If you wish a private tour, this is possible for a surcharge and on request. For each group up to six participants a guide is available. Larger groups are split, so that a guide will have a maximum of six participants. Minimum age 16 years. Younger participants can ride an e-bike. Unfortunately, pregnant women can not participate in the tour. If the tour can not take place due to extreme weather conditions, e.g. storm, heavy rain or thunderstorms, you can get an alternative tour date or a full refund. The tour takes place in case of light rain. Detailed information about the Barcelona Card can be found on the booking page. The issuing office is located at Passeig de Pujades, 7. This is the street that runs along the northern side of the Parc de la Ciutadella. It is easy to reach and find. By metro, get off at station Arc de Triomf (L1). With the booking confirmation you will receive detailed directions. Free cancellation up to 48 hours before the booked tour: no cancellation fees, you will get the full amount refunded. Less than 48 hours before the appointment or in case of no-show: no refund of the amount paid. If the tour can not take place due to bad weather, e.g. storm, heavy rain or thunderstorms, you can get an alternative tour date or or a full refund. In this case the tour will be canceled by the guide immediately before the event. Booking without risk: unused Barcelona Cards received via mail can be returned until 15.01. of the following year (if the Barcelona Card was bought on our website), we will refund the full purchase price. If you have booked the shipment by e-mail voucher, you can cancel the Barcelona Cards up to six weeks after the booking, but not later than 15.01. of the following year. Up to 5 days before the appointment: no cancellation fees, you will receive the full amount refunded. Up to 48 hours before the appointment: refund of the amount minus 20 € per vehicle. Less than 48 hours before the appointment: no refund of the amount paid. The architect Josep Vilaseca designed the monument as an allegory of the respect that the city of Barcelona made for the nations and provinces that participated in the 1888 World's Fair. From the Arc you reach the Parc de la Ciutadella on the car free Passeig de Lluis Companys. The sculpture Homage to Picasso, the world-famous sculptor Tàpies and an artificial designed water ditch evaluate the road. By metro you get off at station Arc de Triomf with the lines L1 and L5. The Moorish style, which was currently fashionable in Spain, serves as a counterpoint to the buildings that have been used in Barcelona to date: Gothic buildings and modern structures in the Eixample district. Vilaseca decorated the brick arch with sculptural motifs. The combination of red brick and the row of friezes as decorative borders around the arch make it a uniquely beautiful landmark of Barcelona. If you take a close look at the bow, you will soon realize that the triumphal arch was the gateway to modern late 19th-century Barcelona. If you look from the Park de la Ciutadella to the Triumphal Arch, the gate points towards the modern Eixample district. You can find some stone bats attached to the triumphal arch. It was the emblem of King Jaume I. (1213-1276) (James of Aragon). Under Jaume I., Barcelona flourished economically and he liberated Valencia, Menorca and Mallorca from the Moors. On 31 December 1229 his troops concered the city of Medina Mayurka. The bat was his lucky charm. The city of Medina was later called Ciudad de Mallorca and in 1717 it was renamed again in Palma de Mallorca, as the city was called in Roman times. The bat is still the emblem of Valencia and was for example also part of the first crest of FC Barcelona. You will find the bat again and again in structures of Modernism, the Catalan Art Nouveau. Animal symbols were repeatedly used in the Modernism, which symbolizes the independence of Catalonia. The dragon, which symbolizes the patron saint of Catalonia Sant Jordi, is a good example. During the Segway-Tour you will have lots of fun and you can see the Arc de Triomf. With the Barcelona Card you get many discounts at sights in Barcelona and free public transport. Freely accessible, the Arc de Triomf can only be visited from the outside.